The Madeira Embroidery is one of the world’s best and was often purchased by royal houses of Europe over the past 100 years. The secret is in the plight of the designs and the high quality of the parts that only receive the guild seal of Madeira Embroidery Institute after rigorous inspections. One of the driving forces behind this activity was Miss Phelps. She was the daughter of an English merchant, who came to Madeira in mid 1850. Impressed by the manual ability of local women, taught them the techniques of broderie anglaise. Quickly assimilated these teachings, Miss Phelps sent some of the first pieces to England, and then rained down orders. She started up a new art on the island. 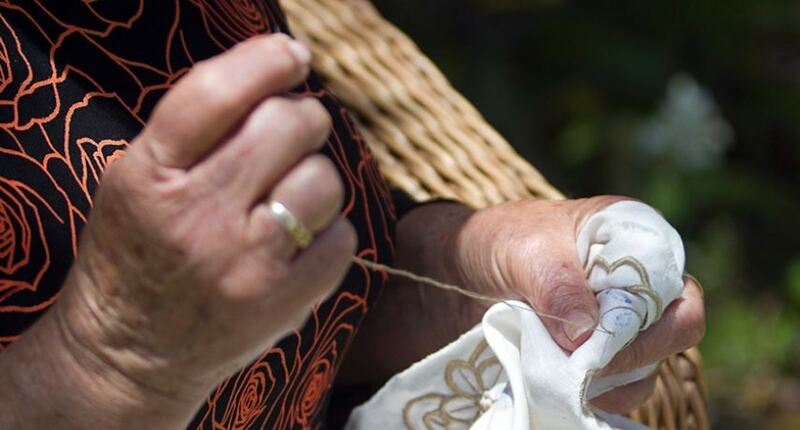 The Madeira embroiderers were so competent and original that three decades later they had imposed a style that would become known as madere broderie. Embroideries brought a new source of income for thousands of families. In 1906 there were 30,000 embroiderers in rural areas, which joined the two thousands of professional embroiderers in Funchal. Most of the work was done at home, with the final finishes made in Funchal factories. It was the Germans that were established here who made this a real labor export industry, introducing faster techniques and increasing production to levels never dreamed before. With the entry of Portugal in World War I, in 1916, German citizens living here were hospitalized and their properties were confiscated. Then there was the appearance of other foreign companies competing for the place of the lucrative German companies. American of Syrian origin came to dominate the industry, flooding the world market with low-quality cushion covers. This had a negative effect on the image of Madeira Embroidery and decreased sales between 1916 and 1925. In 1925, two American entrepreneurs, Charlie Rolland and Leo Behrens invested in the recovery of the Madeira Embroidery quality. They created the Imperial Linens Company and introduced new techniques inspired by the embroidery of other European countries such as Italy, Switzerland, Spain and France. Introduced new motifs and designs taking as model the flowers and other plants of Madeira. Added feathers, shells, marine motifs and scenes of daily life in Funchal. Thanks to this renovation, it was born the Madeira embroidery as we know it today. One of the most famous pieces of the Imperial Linens Company was the tablecloth Princess Grace, designed by the talented German designer Herman Klein, at the wedding of actress Grace Kelly to Prince Rainier of Monaco. From the initial idea to the finished product is a long way to go. First, the design is intended. Then pick up the fabrics, colors and the most appropriate lines (for quality reasons are often imported). They decide to use the points and proceeds to the respective count. The drawing paper is made and sent to the perforation department. The model comes out, then is brought to embroiderers that will do the job. The expertise of these women is legendary. They sit in groups, sometimes with three generations working side by side. They work quickly and the younger people learn the craft. Once taken to the factory, embroidery has also to pass through several quality inspections before receiving the guild seal and the supporting label. Only then it can be put on sale.